Jonathan Stark wants you to use his Starbucks card, which he is using as a kind of social experiment. 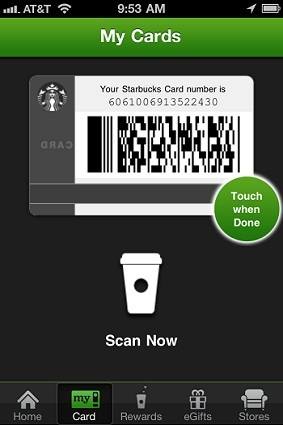 He has posted the screenshot of his mobile Starbucks card from the Starbucks iPhone app and is inviting people to use the card and get their drinks, free, on him! He asks that purchases be kept to under $3 and that users Tweet or blog about his project to keep it going. And, if you want to pay it forward to the next coffee-lover in line, you can go ahead and add a little money to the card’s account. To join in, you can download the image of the card here and read more about the project. To check the balance of the card, follow it on Twitter.